Decorative cupcakes are surely attractive. Besides, they are also sweet treats for various occasions. Almost everybody loves these mini cakes. If you are one of those people who are good at baking and decorating cupcakes, why not start selling them and make profit? Here are some things to consider for your cupcake business starter. Mostly, cupcakes buyers are women. They buy cupcakes to be served at several occasions such as family gatherings, baby showers, birthday parties, weddings, and other social events and parties. As party planners will be busy preparing the event details, easy ordering will be their convenience. The most important things about cupcakes are of course taste and presentation. Unique themed cupcake toppings will be a plus for your homemade cupcakes. If you have quite huge modal to start, you can rent a storefront at the beginning of your business. If not, starting from home is perfect. Take pictures of your cupcake samples and post them on online shop. This way you give your busy customer a favor by providing online pre-order. When your online shop is set and you start to gain revenue, then it is time to think about renting a storefront. People look for cupcakes for different occasions; however, your brand and logo are two of the first few things people will notice from your shop. Besides interesting, your cupcake shop brand and logo should also be representative. Signify your great service with the right choosing of shop name, appealing logo and image, and values. 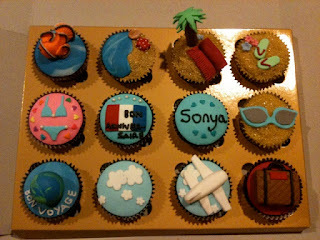 Online shop is where you market your cupcakes to your customers. For this, you need to be familiar with online marketing, website design, online payment, and other details. If you are new at this, no need to worry. Search on the internet and you will get a whole lot of tutorials on starting your online business. Now that you have your targets, appealing brand, and online shop, the only thing that's left is customers. These people determine the success of your cupcake business. Personalize your business cards; some coupons for prospective buyers work as well. You can promote your service either directly or online. For direct promotion, you can start offering cupcakes to your friends, neighbors, colleagues, or other acquaintances. You can also offer your cupcakes to caterers, wedding planners, and other business owners. Meanwhile, you can also promote your business online by registering your shop on Google maps and sending email newsletters to a list of prospective buyers' e-mails.